The Barn, originally uploaded by SkeletalMess. Picture taken over the weekend of a local barn located minutes from home. I like it very much. Would you ever consider sharing with us how you use your textures, ie. which one, blending mode, opacity, etc? My experimenting just never seems to look right... Thanks. I seem to get this request often, so I'll take it into consideration for future posts. What a wonderful barn ~ and so huge! Love photos of old barns. So many stories within the walls. What a lovely barn! One here in the south don't quite have that architectural flourish. I mentioned your blog (with link) in my post today, and showed my readers what one of your textures can do to a photograph. I love barns - this one is so stately. I always wonder about the history behind them. Very calm and serene picture. Great shot. I love barns! We have a large red one near our house and I always glance at it as I drive by. Your work is spectacular...both your photographs as well as your textures. I can't recall exactly how I discovered you but I can say that I'm very, very glad I did. Thank you for sharing so generously. I'm a sucker for old barns. You lucky soul, to have such a cool barn close by. Jerry, Jerry... where have you been all my life???? You captured the barn's soul...beautiful. I love your work! Great image and post processing! fantastic work, great barn, I love old barns. thanks for sharing. Phillipa. That's a good barn for Photographing! And only minutes away, awesome! What an awesome subject to have so close to home. Keep up the great work! I love the cream lit-from-within tone, and it's a lovely shot of a grand old barn. I have always been in love with barns. This is a gorgeous photo of a old barn, I love the way the clouds are clearer in the middle of the shot. I love the feeling of serenity this image evokes. Love the picture. 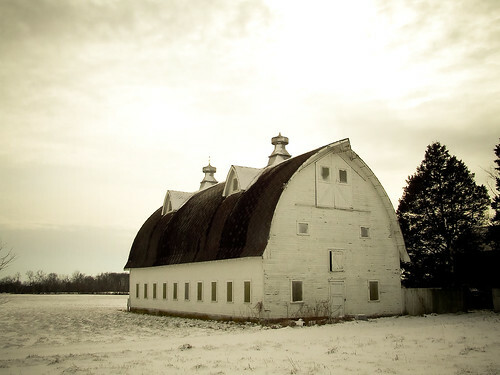 I like the shape of the barn and all of the texture and contrast that you captured. Jerry, you amaze me! Love to look at your work in my reader...some day I will have all the fun software and a kickin' camera and be able to try things. For now, you inspire me! I love barns! And this one is beautiful!